WEEKLY EDITION JULY 18, 2018 The Trump administration recen tly issued a final rule expanding association health plans (AHPs) as a means of helping small businesses and self - employed people get af fordable health coverage. "The Trump administration hopes to level the playing field between large companies and small businesses by expanding access to association health plans," Labor Secretary Alexander Acosta told reporters on Tuesday. "This expansion will offer millions of Americans more affordable coverage options." Acosta said government forecasts estimate the rules will allow as many as 4 million people to gain coverage through AHPs, including 400,000 who are currently uninsured. The final rule broa dens the definition of an employer under the Employee Retirement Income Security Act (ERISA) to allow more groups to form AHPs as an alternative to the Affordable Care Act health exchanges. ERISA is the federal law governing health benefits offered by larg e employers. Under the final rule, AHPs may be sold nationally, in groups of states or in a single state, according to the Labor Department. States will continue to regulate them, although the American Society for Associatio n Executives (ASAE) and others, including the PSAI, had pushed for AHPs to be exempt from state regulation. 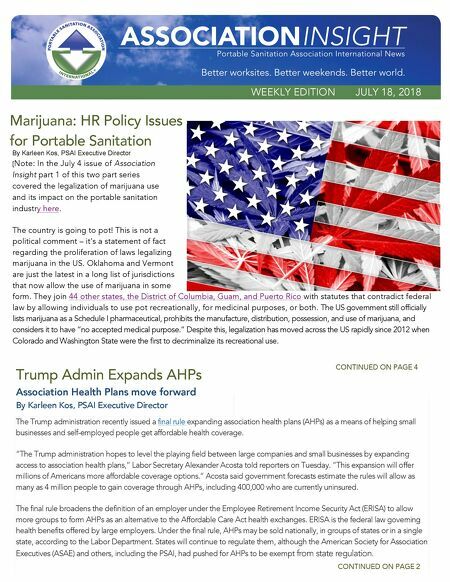 Marijuana: HR Policy Issues for Portable CONTINUED ON PAGE 2 CONTINUED ON PAGE 4 1 Trump Admin Expands A HPs Association Health Plans move f orward By Karleen Kos, PSAI Executive Director 2 [ Note: In the July 4 issue of Association Insight part 1 of this two part series covered the legalization of marijuana use and its impact on the portable sanitation industry. Read it here .] The country is going to pot! This is not a political comment – it's a statement of fact regarding the proliferation of laws legalizing marijuana in the US. Oklahoma and Vermont are just the latest in a long list of jurisd ictions that now allow the use of marijuana in some form. They join 44 other states, the District of Columbia, Guam, and Puerto Rico with statutes that contradict federal law by allowing individuals to use pot recreationally, for medicinal purposes, or both. The US government still officially lists marijuana as a Schedule I pharmaceutical, prohibits the manufacture, distribution, possession, and use of marijuana, an d consi ders it to have "no accepted medical purpose." Despite this, legalization has moved across the US rapidly since 2012 when Colorado and Washington State were the first to decriminalize its recreational use.